The Atmos brand offers smooth, and tasty vapor production along with functionality and portability with its second generation Atmos Vicod 5G Vaporizer. This unit is a dry herb portable vaporizer that features an impressive 2200 mAh and accurate temperature control coupled with a sleek design. This particular device is the upgraded version over its original version, the Amos Vicod 5G in several ways. The 5G 2 now boasts a rubberized finish that is heat resistant. This upgrade in functionality ensures that the vaporizer’s exterior body doesn’t burn your hands during use unlike the older version. The 5G 2 also now comes with a much needed wax cup to vape oils, waxes and other concentrates. This much-asked-for upgrade is a feature that sets the Amtos Vicod 5G apart from other herb only units. In addition, the 5G 2 comes with a new OLED screen that is brighter and more convenient to operate. The Atmos Vicod 5G 2nd Generation is a portable vaporizer that delivers comfortable herb or oil hits no matter where you are. The Atmos Vicod 5G 2 features a ceramic heating chamber. The oven on this unit extracts the flavor and desired effects without any of the irritation of smoking. This unit offers tokes that are smooth, clean and rich in flavor. This is due to the fact that the Atmos Vicod 5G 2 slowly heats up the dry herb by moving hot air through your dry herb instead of your dry herb being in direct contact with the heat and flash vaporization. The result is a greatly reduced chance of combustion in the vape and a burnt taste in your mouth. The food grade ceramic convection oven on the Atmos Vicod 5G 2 does not react chemically to heat. Because of this, the unit produces pure, flavorful hits and minimal odors. 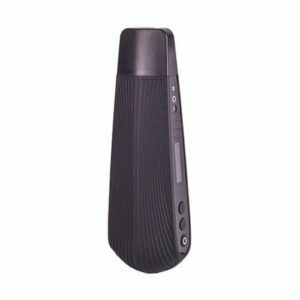 This vapor quality of this portable vaporizer is on par with that of its desktop counterparts. As you can see, The Atmos Vicod 5G 2 is a huge upgrade over its predecessor. This vape is also more durable and feels more secure in your hands, as the manufacturer has taken special care to add heat resistant materials and a rubberized finish that encourages ergonomic comfort. Its slick new design improves grip, more often preventing you from dropping your vape in the first place. This innovative design also stays cool even during a full session, so vape as long as you’d like and it won’t get hot. The Atmos Vicod 5G 2 is available in a variety of slick colors, including red, orange, black and white. If you’re in the market for a portable vaporizer that is easy-to-use and has exceptional vape quality, you won’t be disappointed if you make the Atmos Vicod 5G 2nd Generation your first choice. Dimensions: 1.75" x 5.5" x 2.75"
Over all I love this little unit. Works very well. The battery life is “ok”. If your a heavy user I would suggest getting a unit with a bigger chamber and battery. For the occasional user this unit is perfect. Light, compact, heats up quickly. It’s perfect for me.